My mother would think this landscape is too messy, but I’ve always wanted to replace my front yard with a sea of flowers. I’m just afraid I’ll screw it up and it won’t look pretty … it’ll just look messy. Farmhouse Landscape by Pipersville Landscape Architects & Landscape Designers Dear Garden Associates, Inc.
Maybe I could make that change to the front yard in stages. I could start with just part of the yard like this home. 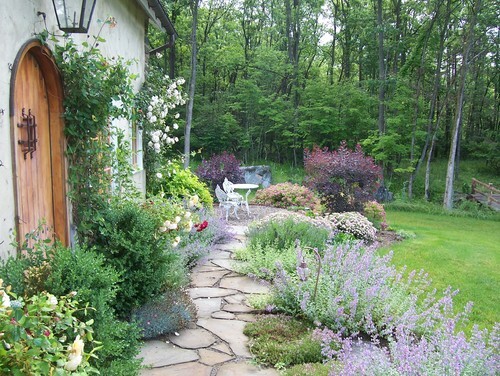 A flagstone path breaks up the flowers and creates a somewhat organized feel while retaining cottage charm. Straight pathways don’t belong in a cottage style garden. They need to wind and ramble around, mimicking the flowing flowers. 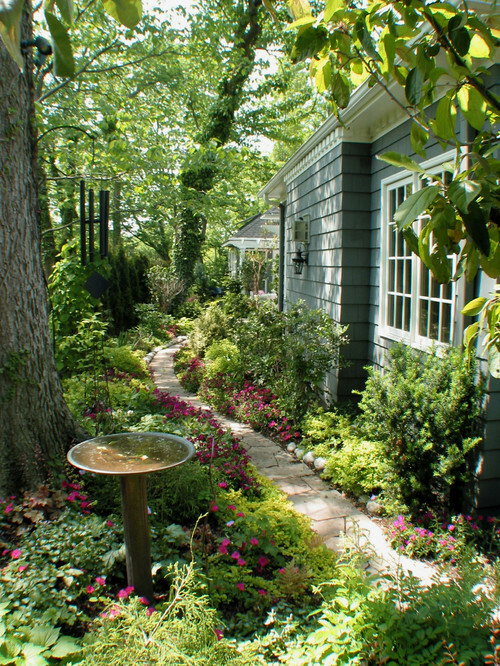 A narrow path like this with a simple bird bath is perfect for a side yard. I love how the plants run and tumble into each other. 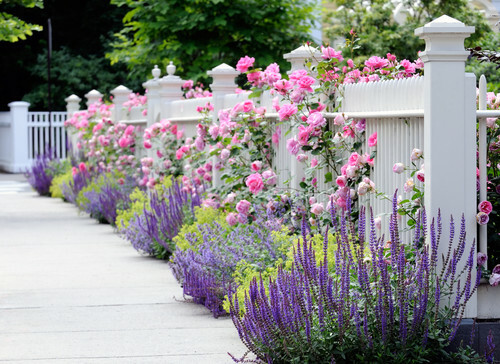 Pink roses ramble over this pretty white fence while purple sage stretches up to greet them. 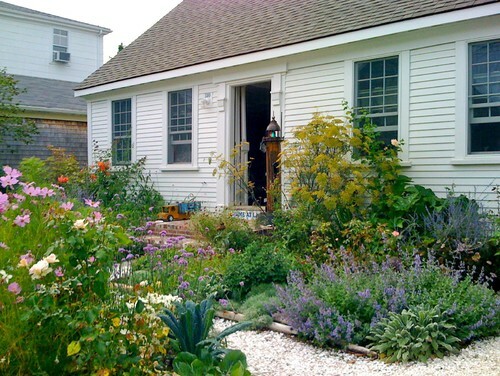 This garden has cottage style without being messy since the plantings are orderly, yet full. 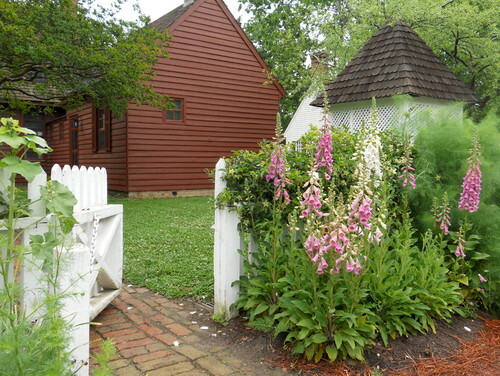 Foxglove, the quintessential cottage flower, frames this home’s picket fence. One summer my neighbor had a bunch of these in her backyard and it was breathtaking! Nothings screams cottage garden like an old-fashioned arbor! 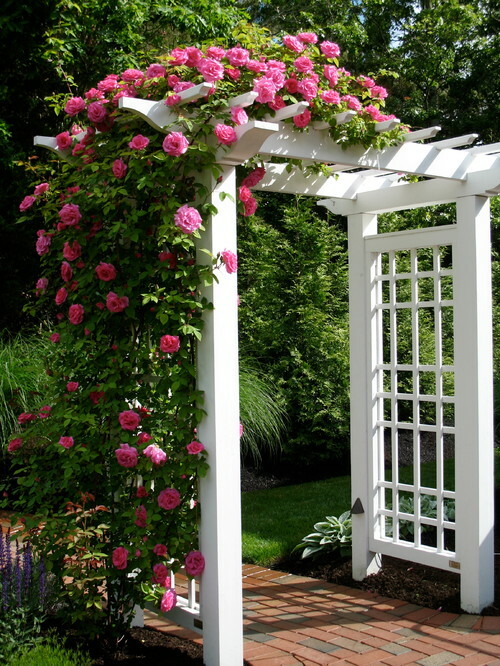 Train roses to climb up and over its arch to create an architectural statement. In past years I’ve grown roses but without much success. They always seem to get black spot and never look good past the month of June. 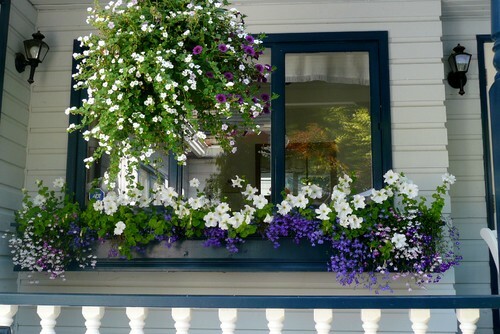 Flower boxes are such an easy way to add cottage style and charm to your garden. I’ve added flower boxes to every house I’ve ever owned. 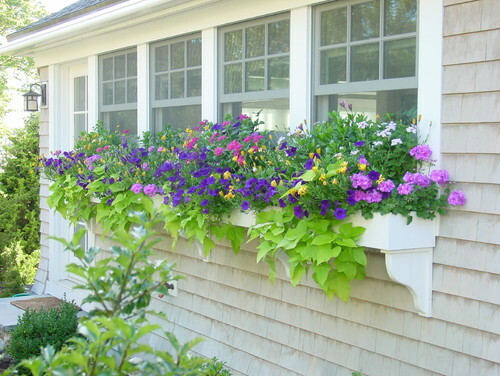 A flower box is a great way to bring the flower garden up close to the house. 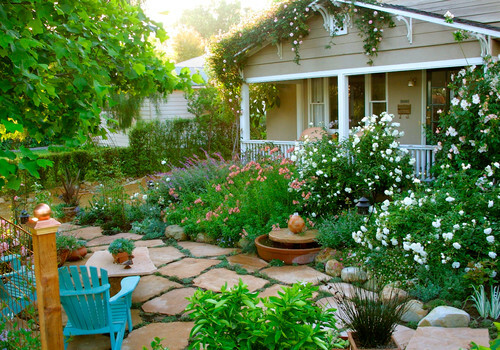 Or if you don’t have a lot of yard space, it’s a great way to get your flower fix. 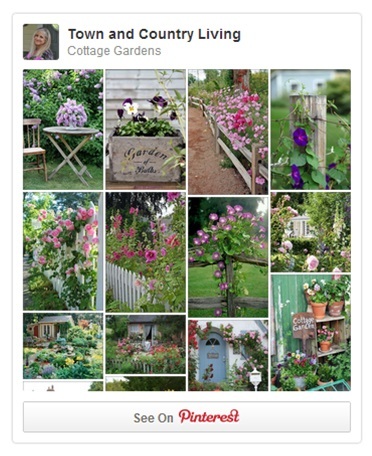 To see more cottage style gardens, visit my new Cottage Gardens board on Pinterest! Love all the inspiration pictures. My fave is the white picket with the beautiful sage and pink roses. So pretty. Have a wonderful 4th. I love them all. This is what I work at yearly. It takes time for all the spaces to fill in. Have fun with it! Happy 4th. B.
Hi Jennifer, the gardens are all beautiful! 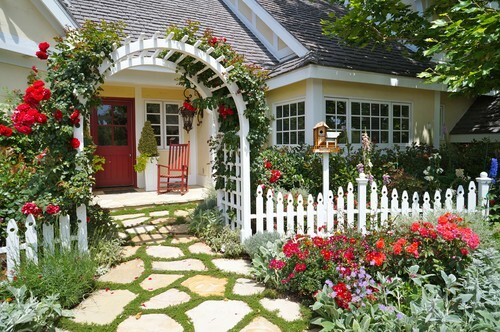 I especially love the cottage porch with the hanging basket and the arbor with the pink climbing rose! So pretty. Stunning, just stunning! Seeing these even tho slightly sun burnt from yesterdays party makes me want to get out in my yard and re-create every scene! Thank you for sharing these lovely photos. I am always looking for new ideas to incorporate into my garden in North Carolina. About four years ago, I removed all the grass remaining in the back yard and replaced it with flowers and shrubs, creating a southern coastal version of a cottage garden. Grass lawns are burned into the American psyche, so it was a big and scary jump, yet I have never regretted this decision. The garden makes me feel so relaxed, whether I am taking a stroll, reading or even weeding. Guests to my house seem overwhelmed by the beauty and are convinced that I am some kind of gardening genius, but I really didn’t know what I was doing when I forged ahead with my vision. I just picked plants I liked, then planted them where I thought they would do well and compliment each other. Sometimes, the locations I picked for certain plants were not ideal, but I just moved them to a better place for the next season Trial, error and problem solving led to eventual success. Last year, I felt so successful with the back yard, that I started to remove the grass in the front yard, too. I’m doing it in stages and there’s a bit more intentional design, this time. My neighbors sometimes stop to ask me questions, so I’m glad I did this in my back yard, first. As a shy person, that experience better prepared me to provide answers. I can tell them about my vision with a bit more confidence. There are a few things I found important to my project that I would like to share with anyone who might wish to try this:1) I live in a hot climate, so I have a sprinkler system attached to a well that makes this garden green throughout the year. It is more successful in keeping the garden green than it ever was in keeping the lawn green, but I did have to raise the sprinkler heads so that they wouldn’t knock the petals off of my favorite flowers. 2) I planned my major pathways in the backyard, but I wish I had planned more secondary pathways with stepping stones through the planting beds. I sometimes find it challenging to figure out where to step while I am weeding. I have retroactively moved some flowers and replaced them with stepping stones to provide better access. I’m trying to plan more paths for the front yard, so that I can weed more easily. 3) MULCH, MULCH, MULCH. If you keep the garden mulched appropriately, you will have much less weeding to do. Use a mulch that feeds the plants, rather than a hardwood mulch that just looks pretty. 4) Incorporate your favorite edibles into the design. I loved my garden when it was just flowers, but I gained a new appreciation for it when it started providing me with blackberries, blueberries, cherry tomatoes. and muscadine grapes. Make the jump! Flowers are much more satisfying than grass. Best wishes! Thank you SO much for sharing your gardening experience along with the excellent insight and tips!! I like your idea of starting in the backyard first to build confidence. Our backyard is very small and would lend itself to a cottage garden filled with flowers and perhaps a few edibles. Loved the point about remembering to incorporate pathways that make sense. I really appreciate that you took the time to share valuable information here where readers can see it!! Sandra Jackson, you should post some photos of your new yard! I would love to see your transformation. My cottage garden took 3 years to fill in. I wanted it thick enough to keep most weeds out. My wildflower garden just gets mowed off in the fall, sprinkled with the seed heads, a little mulch thrown on and its good to go for next year. Lovely, just lovely…and so very creative. Its 100 degrees here and I want to get out there and plant some flowers which will live!!! Absolutely love the yellow home and picket fence! All the photos have wonderful ideas. Thanks so much for sharing!